Neck and Upper back pain can affect all of us at one time or another in our lives. So here are 5 easy ways to help prevent it occurring. As a rule we have quite sedentary lifestyles and the use of mobile phones, laptops and computers plus driving, cycling and looking after small children can maintain a position of arms forward and head up. We may hold this position for hours at a time. This can lead to fatigued muscles and inflamed joints. These ‘overworked’ muscles and joints need a break regularly. Muscles need fresh blood with oxygen and nutrients and joints need to be moved to increase the lubrication of synovial fluid within the joint itself. 1. Take a break from your desk regularly– ideally every 30 mins- and get your upper back and shoulders moving. 2. Reduce ‘Arms forward’ position. This contracts your pectoral muscles which in turn pull your shoulders forward. Stretch your pectoral muscles regularly at work, after driving, cycling. 3. Get your neck moving .If you are making sure your upper back is moving better with exercise 1 your neck will benefit too. But gentle exercises for the neck will improve mobility too. This exercise keeps the neck still but moves the shoulders, increasing overall rotation. 4. Change how you move. If you get aching pain on one side of your neck and shoulder in particular look at how you interact with your work colleagues. Do you always turn to one side to talk to them? Do you find yourself turning to one side as someone walks past? Are your computer screens to one side? These will have an effect on your neck and shoulder muscles causing one side to work more than the other. If you can, change your desk position. Rather than turning to talk to your colleagues move your whole body and face them head on. Align your screens so they are straight ahead of you. Hopefully you get the picture. If you experience shoulder and neck pain on the same side as you use your mouse then this can really help. You may not believe it but your Biceps is responsible for turning your hand anti-clockwise which you do every time you click on your mouse. The Biceps can become really tight and as it is also attached to your shoulder, it can pull your shoulder forward. This, in turn, can cause fatigue in the corresponding shoulder and neck. 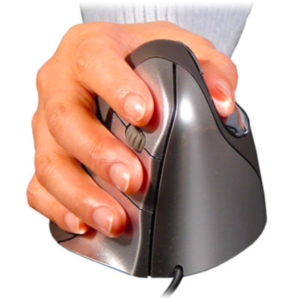 A Vertical Mouse stops the Biceps from being involved completely. Patients who have used this said it has really made a big difference. Their cheap too- get them on Amazon. I hope you have found the exercises and advice useful. Remember all the exercises shown should be pain free. If not, then just stop and get in touch and I can modify them for you. This article describes how a lack of heel mobility can have a related effect on back pain as well as other common foot and heel problems. As the heel strikes the ground there should a relatively small inward rotation or ‘pronation’ followed a similar but greater movement of the mid foot (the arch). The force and weight is then transferred to the metatarsals before push off by the big toe and others. If the heel does not roll in then the mid foot has to roll further. This in turn increases the stresses through the connective tissue along the base of the foot called the plantar fascia. The lack of movement at the heel also causes greater stress through the Achilles tendon. These increased stresses over time can cause Plantar Fasciitis as well as heel spurs and tendonitis. This extra roll of the mid-foot has been termed ‘over-pronation’ and it can lead to greater stress and force through the joint at the base of the big toe. The body responds by laying down more bone in that area to cope with the extra force. The joint becomes larger and the toe is forced inwards forming what is commonly known as a bunion. How can lack of movement in the heel create back pain and vice versa? There are two perspectives to consider when looking for causes of heel and back pain. Ground up forces. That’s to say the forces involved as the heel strikes the ground and the chain reaction of energy and movement as it passes up through the leg to the spine. The weight and therefore force of our torso, head and arms is distributed through our lumbar spine and evenly distributed through our pelvis via our sacrum into our legs. To help manage this we have large lumbar vertebrae, thicker discs, strong postural muscles and a matrix of interconnected pelvis and hip muscles such as gluteal muscles and hip flexors and core abdominal muscles. However with our increasingly sedentary lifestyles our hip flexor muscles can become more contracted and shorter. This can lead to a slight forward tilt in our pelvis. You can see from Fig 1 how it can increase an inward movement on the upper and lower leg and ultimately encourage increased pronation in the foot. This in turn can lead to foot and lower leg problems described earlier. Also this can lead to tighter lower back muscles (see Fig 2) and increase the risk of lower back pain. As the heel strikes the ground it is designed to roll inwards. This is called pronation and it is totally natural. The mid foot follows followed by flexion of the toes and especially the big toe. This inwards roll of the heel bone initiates a subsequent inwards rotation of the lower leg then the upper leg and eventually the hip. It is the inner rotation of the upper femur and hip that gives the gluteal muscle the cue to contract and extend the hip, propelling the body forward to the next step. So that first small inwards roll of the heel starts a chain of events culminating in the contraction of the most powerful muscle in the body. However if that inwards roll doesn’t happen then ultimately the gluteal muscle does not contract as efficiently and the lower back postural muscles become involved as they help out the hip to make the next step. That is on top of the job they already have providing stability and mobility to the lumbar vertebrae. A recipe for over work and fatigue of the lower back muscles and ultimately back pain. Why does the heel become less mobile? Tight calf muscles can be one cause of restriction of movement into the Achilles tendon which in turn attaches to the heel. A reduced mobility of the calf muscle can be due to a number of reasons. Here are some. Increased weight: As we get older increase in weight can go onto our tummies. This in turn can change our centre of gravity and bring it slightly forward. Our calf muscles get involved helping to pull us backwards and maintain our balance and CoG over our mid point. Shoes: that elevate our heels can cause a shortening of our calf muscles. Research has also shown that there is a correlation between high heeled shoes worn and Bunions. The foot is placed in extreme flexion and forces are compressed at the base of the big toes. A lack of heel movement can also be due to previous ankle injuries: significant ligament strains and fractures can lead to a lack of movement between the joints in our ankles and the heel bone. This in turn can lead to increased load on the calf muscles and tendons. In order to effectively treat foot pain and injuries from calf through to big toe Hugo assesses all aspects of the foot, leg, hips and lower back. Evaluation their mobility and ability to move as part of a chain reaction of events. Likewise if back pain is the symptom Hugo will always assess foot and hip movement as part of the process and treat accordingly. Hugo uses 3D Functional movement exercise as integral part of his treatment to help enhance the movement of joints and muscles and combines this with Osteopathy treatment to improve tissue health and return you back to pain free movement as quickly as possible. Pain Killers are not recommended so what can you do?